From the perspective of a linguist, however, I do like the idea of really obscure linguistic communities, ready and waiting to be discovered and documented. On the flip side, it is selfish of me to want these small communities to remain in a bubble, free from the very same benefits I enjoy in belonging to a modern, post-industrialised society. Our goal, then, should probably be more focused on documenting, as opposed to saving, these languages. SEM is a multiequational modeling system suitable for asking complex questions about the responses of systems to interconnected sets of explanatory factors [9,10]. 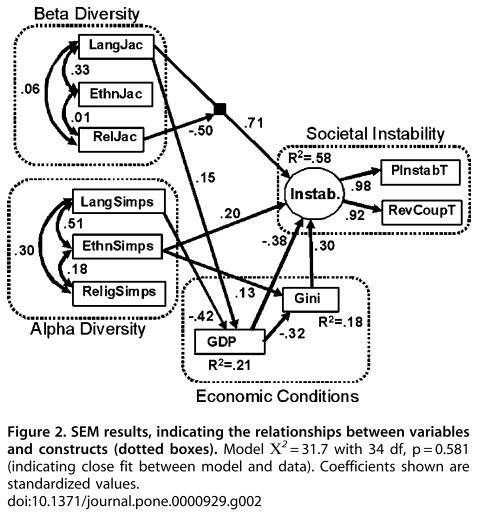 Using SEM we probed the contributions of multiple cultural diversity measures to international variations in economics and societal instability. We evaluated the direct and indirectly-mediated effects of linguistic, religious, and ethnic diversity (both within-nations and across-nations) on indicators of societal instability while controlling for the correlated effects of population size and number of borders. Looking at these factors, rather than using economic performance, the current study’s key finding is that more diversity is associated with more instability. What’s really interesting, however, is that different types and domains of diversity have interacting effects. As Razib predicted, linguistic diversity does have a negative effect on economic performance — and it is through this economic mechanism that societal instability increases. This is true for both within and between measures of diversity. On the other hand, religious diversity between-nations produces the opposite effect: it reduces instability. 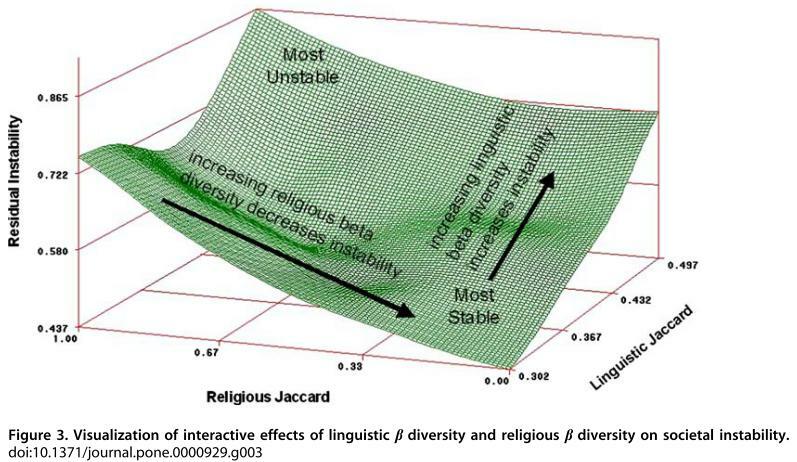 Now, the surprising part is that religious diversity is especially effective at reducing instability in the presence of high linguistic diversity. Alexander  argued that religions are cultural inventions which function to extend nations, suggesting that the unit of a ‘nation’ is an emergent property of unifying distinctive belief systems. It therefore may be that a shared religious or moral system within a country which differs from those surrounding countries leads to a sense of shared identity, common purpose or harmony. I don’t expect this to be the final say on the matter, and, like all studies looking at such a complex subject matter, there are limitations to the scope of current study (some of which are noted in the paper). It also doesn’t really solve the question as to why linguistic diversity is correlated with poor economic performance. This is clearly a job for economists. Though, for now at least, I’m reasonably convinced by Razib’s take on the matter. 1) i’m not defending coercive language change, as occurred with the cajuns in the american south in the 20th century. i’m defending the utility of individuals changing their dominant language usage and ethnic identity because of preferable material consequences. in a perfect world an individual might not change their ethnic identity because of other intangible attachments and values, but it isn’t a perfect world. i’m also expressing skepticism at public policy which aims to preserve languages with very few speakers through subsidy (though i support monies to preserve a record of the languages and culture before extinction). 2) my opinion on the question is of modest confidence. i’ll do a lit search myself, as the arrow of the correlation may vary by region and context. i think the theoretical reasons i proffered in relation to economies of scale are robust, but theory is often wrong. and importantly, i think linguistic homogenization is as much a consequence of development, as the cause of development. in fact, at higher levels of development i think the latter is a more powerful dynamic. 3) the normative gap between myself and my interlocutors is large. I’m not sure I’m reading that graph correctly, but it makes sense that greater differences between bordering nations will tend to increase cohesion within both bordering nations, particularly if the national border is a relatively clear divide for different religions or languages (or other identifiable cultural constructs). Previous Previous post: How and Why did Madness Evolve? ?